Produzieren Sie das passende Werbegeschenk für ihre Zielgruppe. Bedrucken Sie diesen innovativen Werbeartikel corporate stylus stifte oder einen unserer Logo bedruckten Produkte. Tampondruck: Positionen F & H - 40mm x 7mm. Tampondruck: Positionen G & I - 40mm x 7mm. Siebdruck: Position A - 30mm x 12mm (einfarbig). Siebdruck: Position B - 40mm x 20mm (einfarbig). Lasergravur: Positionen F & H - 40mm x 7mm. [*] Lasergravur: Positionen G & I - 40mm x 7mm. [/ list] Der Preis beinhaltet einen 1-farbigen Druck in 1 Position. Your promotional corporate stylus stifte can be silk screen printed in 1 or more colours. 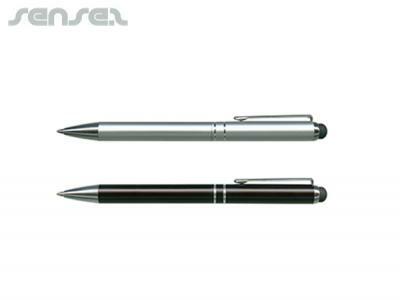 Costs shown include a 1 colour logo print on your custom branded corporate stylus stifte. We can print more than 1 colour, however it incurs extra costs. We can achieve a perfect PMS colour match for the print. Engraving your logo on the promotional corporate stylus stifte is usually done by Laser engraving, where the laser removes a thin layer of the metal surface. Your logo becomes part of the corporate stylus stifte and is impossible to remove. Sometimes the engraved effect will be a different metal colour to the outside metal coating of your product. We can also engrave wood or plastic. Engraving is usually a more expensive branding method. Unsere Spezifisch fuer Sie Produzierten Corporate Stylus Stifte koennen ab einer Mindestbestellmenge von 500 Stücken hergestellt werden. Wir können Ihr Logo auf diese Werbe Corporate Stylus Stifte anbringen. Eine Setup-Gebühr in Höhe von €113.00 faellt fuer die Film Kosten an.